Abdul Jabbar Gull’s extensive exhibition at the Ejaz Gallery, Lahore, addresses and extends the range and development of a singular aesthetic philosophy. The presentation includes large scaled, carved wood forms, wall based reliefs and playful, freestanding pieces that outline the `thakti’design used as a surface for incised and carved areas. A collection of paintings, and ink and wash works articulate the diversity of the artist’s talent. To Gull, this landmark exhibition of his work, holds nostalgic connotation. It is his first solo event in Lahore, a city dear to him. Here he spent formative years at the National College of Arts, and made decisions that were to affect his future. It is by way of taking the opportunity to acknowledge with high esteem, all the art mentors who influenced his life. Since his first solo exhibition in Karachi in 2000, Gull has maintained a commitment that has led him on an individual path, at times solitary but always fulfilling. 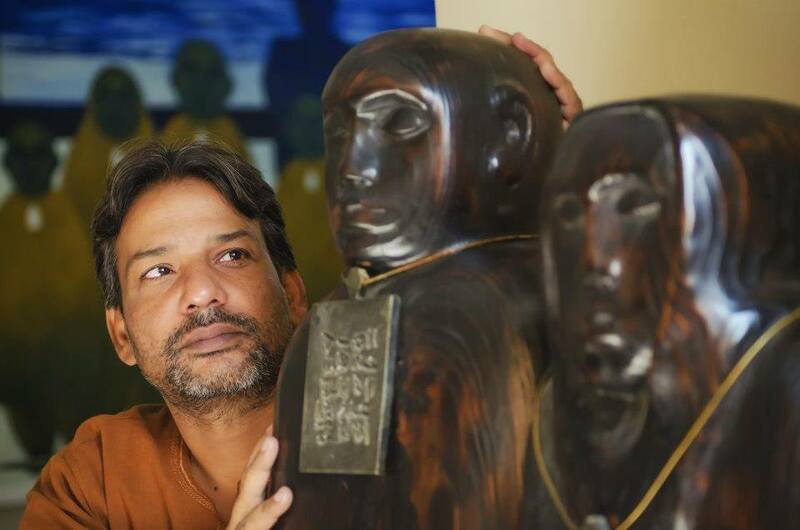 One of a vanguard of young sculptors who have emerged in recent years in Pakistan, he is making inroads in this neglected discipline. Without a tradition to follow, the artist set his own standards disregarding the as yet, limited public awareness. Gull grew up in Mirpukhas, Sindh where in his father’s workshop he explored the qualities of various types of wood, ran his fingers over the grain and felt the pulse within. There were no art activities as such available in his hometown but on the way to school he would stop to watch the sign painters at work. Through this simple interaction grew a desire to practice calligraphy and to draw portraits of his friends, and in doing so developed a strong commitment to art. My work is a reflection of different moods at various periods of my life. The human form for me is the most important phenomenon of the universe. It is a major source of inspiration for me in all my work. Additive processes such as modeling, and subtractive processes like carving, behave in very different ways. I enjoy working in both mediums to disclose different forms. In 2002 Gull was invited to join a three month residency at the workshop in Johannesburg known as the `Bag Factory’, a non-profit organization promoting visual arts through a broad range of activities. The extensive experience brought the sculptor from Pakistan in contact with artists from all strata of society as he carved new pieces, conducted workshops and shared ideas with other artists. The best of resident’s exhibitions they had so far had. Gull’s work hints at a mystery within. He is a sculptor working principally in wood. His main source of inspiration is the human form but the mode of expression is muted…There is a sense of striving within the form to communicate. This tension has a powerful effect on the viewer. Gull states that the experience of Africa had changed his outlook and view of life. In April 2003, a second solo exhibition of the sculptor’s work was shown in Karachi. Carved, freestanding figures measuring 18 inches were grouped into three circles surrounding symbolic objects. Similar forms stood in lines behind a single leader. Questions arose: Are they anonymous figures waiting to be judged? Or are they the judges waiting on us? Each solution seemed to raise further questions. The forms were subtle, suggestive rather than realistically described, distortions evoking the power of the human body and reverberating with underlying energy. Carves directly from the wood, Gull groups together forms that are starkly distinctive, endowing the individual pieces with an extraordinary sense of the organic contexture of the figure. In the purity of subtle curves the columnar structures are individualized by the slight tilt of a head that carries the barest suggestion of facial features. The sculptor’s individual style leans towards abstraction without losing the figurative representation. The metaphysical significance of remote times acts as the artist’s base in which he adapts to an era that sees as one with a growing alienation from nature. Pakistan National Council of the Arts at the 8th National Visual Arts Exhibition held in Lahore. In 2004 a multi media, third solo exhibition: ‘Ordinary Souls’ made an impact on Karachi art enthusiasts. Viewing the work in exhibition, there is much to hold the interest. The artist is adamant that he is essentially a sculptor and the work in oils on canvas, he considers an aesthetic diversion, a deeply inquiring exploration of his own inner thoughts and feelings. Sketching a series of forms intended as ideas to be carried out in the third dimension, Gull translated the concept into a series of large canvases. A self-portrait crystallized his conviction that he is a prototype for everyman, the ordinary soul moulded by environment, tradition and circumstances. The painted figures at first glance appear to deal with male/female representation but actually mirror the twin aspects that constitute every human being. The two sides that make us a whole. Ink/wash pieces are elegant works in which colour creates a contemporary background to areas incorporating a simulated script. The ethos of sculpture is ever present in the use of form and light in the work and in woodcarvings that support theme of an anonymous majority whose destiny is linked to suffering. The carved wall based works surpass rituals and evoke an overwhelming sense of the ultimate essence of gestural meaning. Both `Symbolist’ and `Realist’, in his spiritual quest the artist continues to search for truth, in others, in his surrounding and in his self. Marjorie Husain is a notable art critic and has played a significant role in promoting Pakistan’s art and culture nationally and internationally. She has curated and organized art exhibitions around the world and her writings have been published in all the major newspapers and magazines of the country. She has also authored numerous books on art, including biographies of Pakistani Art Masters.